Former Liverpool winger Dirk Kuyt, who put in consistently brilliant shifts down our right flank throughout Rafa Benitez’s tenure, has explained how Steven Gerrard’s dream is to manage us one day – but that he has to follow his own path in order to get here again. Gerrard got the gig as our U18 manager last season, but decided to depart in the summer to take over at Rangers – for whom he’s doing an exceptional job. Rangers are currently level on points with Celtic at the top of the SPL table, although Brendan Rodgers’ side have a game in hand. 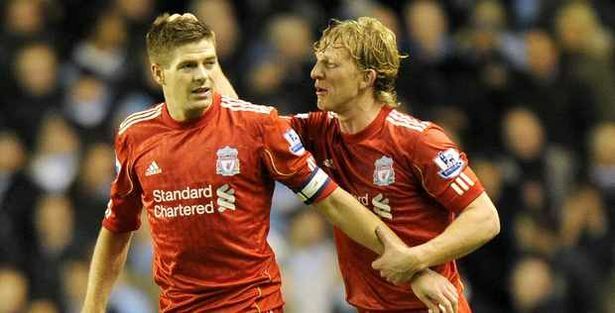 Kuyt has claimed Gerrard quickly decided he needed to forge his own career away from Liverpool, but that his long-term plan will be to return. “When Steven just became a coach with the Liverpool youths, I talked to him about the road he was going to follow,” Kuyt told De Telegraaf. “He made a conscious choice to leave Liverpool right away. “He wants to develop himself as a coach outside the spotlights of the Premier League. “Glasgow Rangers is a big club. His dream will be to eventually become a coach at Liverpool. While we’re obviously delighted with our current manager Jurgen Klopp, it’d be superb if one day Gerrard took the reigns at Anfield. He’s already proving to be a manager not to be messed with north of the border; demanding exceptionally high standards from his players. We want Klopp at Liverpool for as long as he wants to be here, in short. But there’ll come a time when he’s had enough and will likely retire from management. When that time comes, we hope Gerrard is a position where he can replace our brilliant German.